Since I finished the vests for the boys, I decided to do a bit of quilt sewing. I have several kits and this one was just hanging around. It's most likely my smallest kit. Paper piecing isn't really a quick method and although this was a kit with all the fabrics included, I didn't like some of them and decided to use a few of my own. The googly eyes were not part of the kit but luckily, I didn't have to search too hard to find them. The finished paper pieced block is 5" X 4." I added a black border and just left it raw. 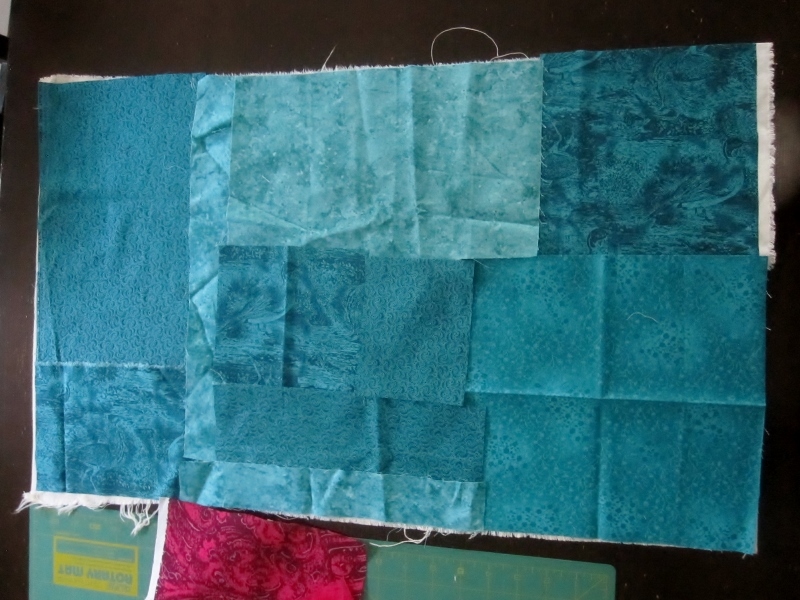 When it ends up as a totally finished block, the border can be cut down to whatever size I need. Right now it will reside in the same box as this paper pieced crow. I may just slowly make assorted paper pieced birds and then put them into a small quilt. 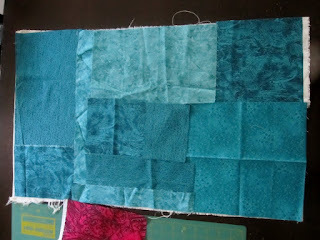 This looks like a bunch of fabric squares and pieces but it's actually the background for a wall hanging I'm working on. I signed up for Ellen Lindner's Floral Improv class and even though all three week's lessons have been posted, I am slow starting. Illness, life and family took up my time and so now I am determined to get on with the course. This was my upstairs hall as I was trying to decide what fabrics to use for the background. 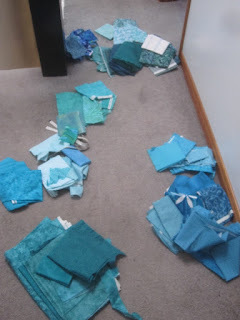 I had light blues and browns in bins but decided to use the teal/turquoise ones. I also had a bunch of gray fabrics too but since it was taking so long to make up my mind, I finally just chose what I had in abundance. Have I missed something in the health situation? Hope all is well with you and everyone else. 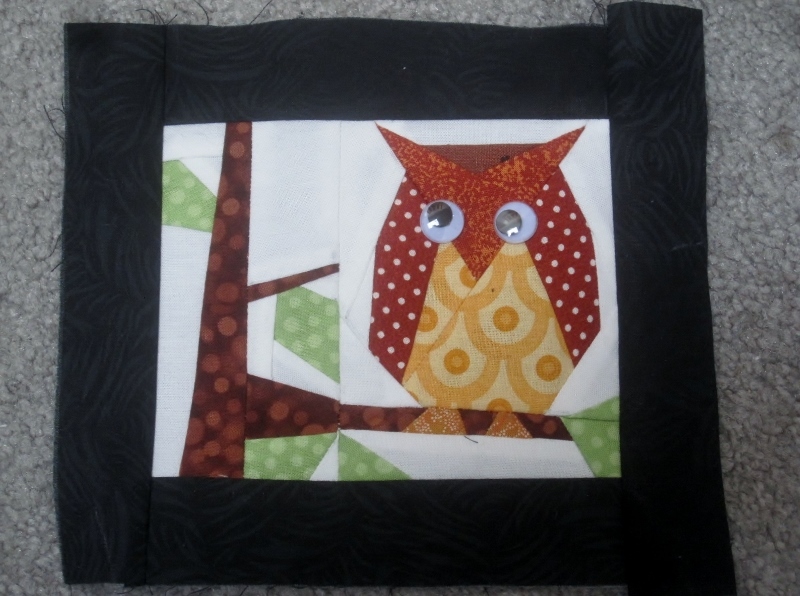 The colours, blues and greens are my favourites, no wonder I had to dig deep to find the reds.I have an owl block that isn't paper pieced, but appliqued on, each part overlapping another. 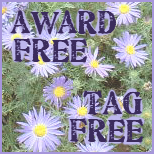 If you would like it, can email for you. 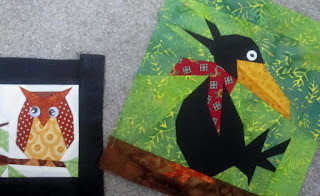 Love the bird blocks and the idea of making more! Beautiful project you are going to work on. LoVe the colors. The birds are charming. I like the idea of a whimsical bird quilt. Pretty background colors! I need o get back to something "pretty" myself. Got bogged down in primitive colors. Lol. Cute owl. The bird quilt sounds fun. You have a lot of blue fabric, which probably makes it harder to choose. Both birds are cute, showing some character too and not just being birds. The idea of a bird quilt sounds great. The owl block is cute, but that crow... Well he's hilarious! I don't care for crows, but that block is darn cute! Love all your blues..... Sometimes too many does make it hard to choose, I agree. Those paper-pieced birds are way too cute!!!! I think a whole quilt with them would be awesome. Love the fabric colors you chose! I like Mr. Owl - he looks perfect alongside the crow so I agree that they should live together. Checked out the class and it looks like it would be fun. Can't wait to see what you do!